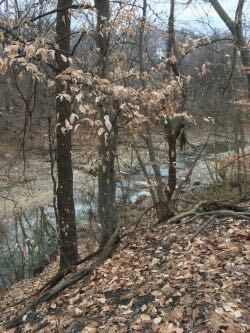 Explore the phenomena of marcescence — deciduous leaves that cling through the winter until they are forced off by new growth — on a walk at Croydon Creek Nature Center with Bresler Resident Artist MJ Neuberger, who applies marcescence as a metaphor in installations, sculptural work and imagery. Join Neuberger on a hike in search of young trees and the translucent beech leaves that, having withstood the ice and snow of the coldest months, begin to fall as spring arrives. Participants are invited to experiment with simple rituals Neuberger uses to arrive in presence in her own practice and to discuss and consider themes of holding on and letting go in nature and in life as a new season begins. Croydon Creek Nature Center is a 30-minute walk from the Rockville Metro and has parking and overflow parking available. This event will only be cancelled in the case of drenching rain or major snowstorm. Wear appropriate footwear for a hike that could feature several muddy and potentially steep sections of trail. Please RSVP for this event, which seeks a balance between being dog and child-friendly, but also hopes to encourage mindful awareness.